Winter rye, no-tilled into corn silage stubble, is providing high yields of quality forage on many dairy farms. Amidst the rolling hills of Lancaster County, Pa., you will find everything from state-of-the-art dairies to picturesque, modest-sized Amish and Mennonite farms. It’s a landscape made for postcard sales; it’s also an area where many dairies have jumped on the idea of making winter cereals a mainstay in their crop rotations. “We like the consistency of yield that cereal rye gives us,” said Mike Brubaker, who farms with brother, Tony, and his father, Luke. The Brubakers seed about 600 acres of rye each year. “The quality of the feed is excellent and it’s a great conservation crop,” Luke added. The Brubaker dairy herd is fed 70 percent corn silage (dry matter basis) with the remaining 30 percent of forage being evenly split between alfalfa haylage and winter rye silage. The winter cereal is also used to feed heifers, which are raised by the Brubakers but at a different farm than the milking herd. The rye tests over 16 percent protein. Liquid manure is applied to some of the rye acres before they are planted, while other acres receive manure in March using a dragline. Harvest generally occurs in late April and corn is no-tilled into the rye stubble, usually in early to mid-May. Benner milks 900 cows on four different farms but has plans to build a new dairy and consolidate the cows. The milking herd is fed 70 percent brown midrib corn silage and 30 percent winter rye silage. The ration powers a 30,000-pound herd average. The winter rye is no-tilled around mid-September into corn silage stubble at a fairly hefty rate — 4 bushels per acre. Like Brubakers, Benner plants a couple of different varieties to spread his harvest window and capture as much of the forage in the boot stage as possible. “We source our normal rye seed out of Canada but then buy an early variety locally,” Benner said. Benner applies liquid manure to some fields, while others receive about 30 pounds of nitrogen in the spring. He shoots for a harvest moisture of about 65 percent. In 2016, Yippee Farms hauled off over 3 tons of ryelage dry matter per acre from their fields. One of those farmers who likes triticale is Aaron Hess. He covets the quality that winter triticale provides but also the fact that it extends the harvest window. Aaron farms with his father, Joe, and operates a 350-cow dairy. “We grow 130 acres of an early-maturing rye and another 150 acres of triticale. 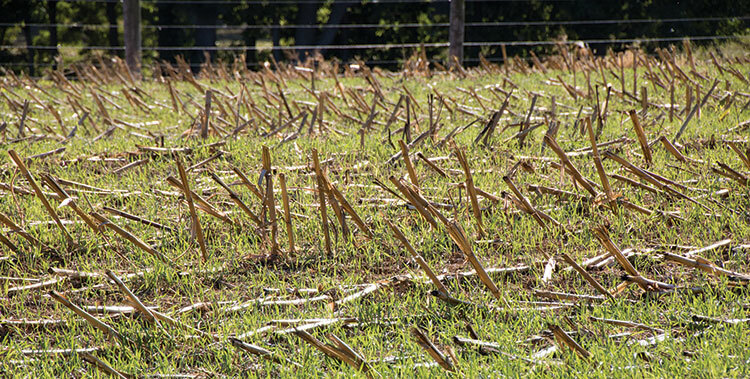 The triticale is ready to harvest about two weeks later than the rye,” Hess said. They daily feed 4 pounds of dry matter to the milking herd along with alfalfa and brown midrib corn silage. Heifers are fed ryelage. The Hesses no-till seed 2.5 bushels per acre of triticale after corn silage. They also include Italian ryegrass and radish in the seeding mix. About 9,000 gallons of liquid manure is applied before planting, and then 50 to 65 pounds of nitrogen fertilizer is broadcasted in the spring. This article appeared in the August/September 2016 issue of Hay & Forage Grower on page 34.